“Ma’am, please help me become a minister. My people are dying without knowing Jesus.” Tong Thor, 21, from Laos wrote one day. He said his people pray to the spirits of their ancestors. Tong’s letter gripped my heart. I wrote Tong back and asked him to pray for Jesus to send extra funds. In September 2008, Tong was on his way to the Philippines to take Theology in Mountain View College. Six months later, I received another e-mail from Singkham, 20, Tong’s friend. He wanted to go to the Philippines to take Theology also. God provided funds for Singkham, too. The following year, 2 more students, Saisavanh and Bounthan, from Laos also wanted to take theology in the Philippines. Again, I stepped out in faith. Soon, we have 4 theology students in Mountain View College. Being far away from home, the Laotian students were quite homesick. But wherever they went, people warmly welcomed them upon knowing they are from another country. The Laotian students volunteered their services to churches near the college. To them the Philippines felt like home. The buildings and houses are quite similar to those in Laos. The students and teachers made them feel at home. 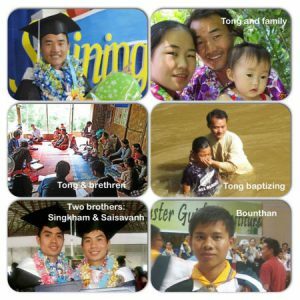 The last of the 4 Laotian students had graduated a year ago and are back in their home country and working under the Laos Mission. It thrills my heart to receive reports of the many people accepting Jesus to be their personal Savior. Here’s a picture of Tong baptizing. We thank the sponsors of Adopt a Minister International for your prayers and financial support. We specially thank the “Penguins” for your continued support of the Laos theology students.